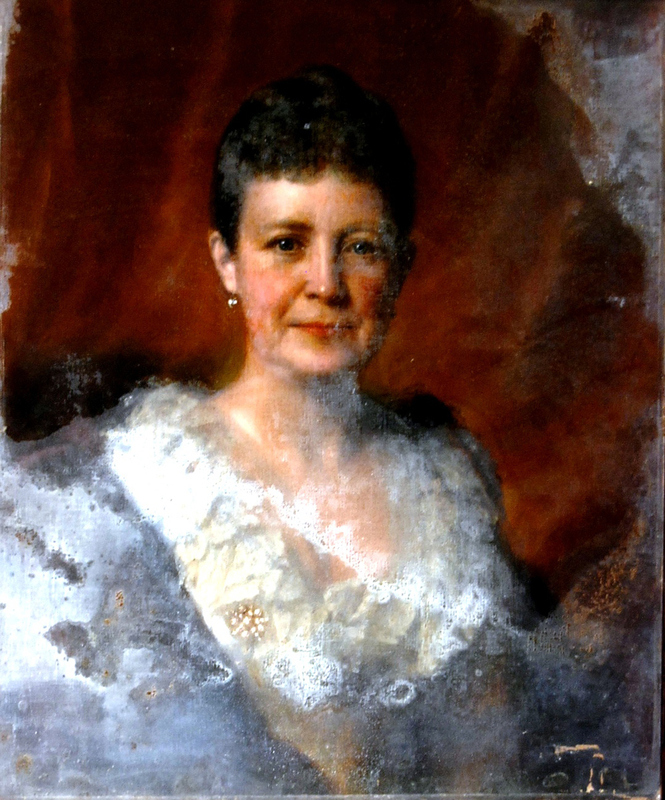 This portrait of Annette Henry Alger was painted in 1891 by Lewis Thomas Ives. The artist was born near Rochester, New York in 1833. Ives started his career as a lawyer, painting part-time, but soon found that art was his passion and turned to painting full-time. He studied in Paris and in Rome. He is best known for painting portraits of government officials in Michigan and Massachusetts. He exhibited his work in many prominent locations. He was commissioned to paint an official portrait of President Grover Cleveland and died before it could be completed. His son Percy, also an artist, finished the painting for his father. The artist died in 1894 in Detroit. Annette Alger was married to Russell Alexander Alger who was a successful industrialist, Civil War veteran and politician. Russell Alger was the 20th Governor of Michigan, a U.S. Senator and the 40th United States Secretary of War under President McKinley. 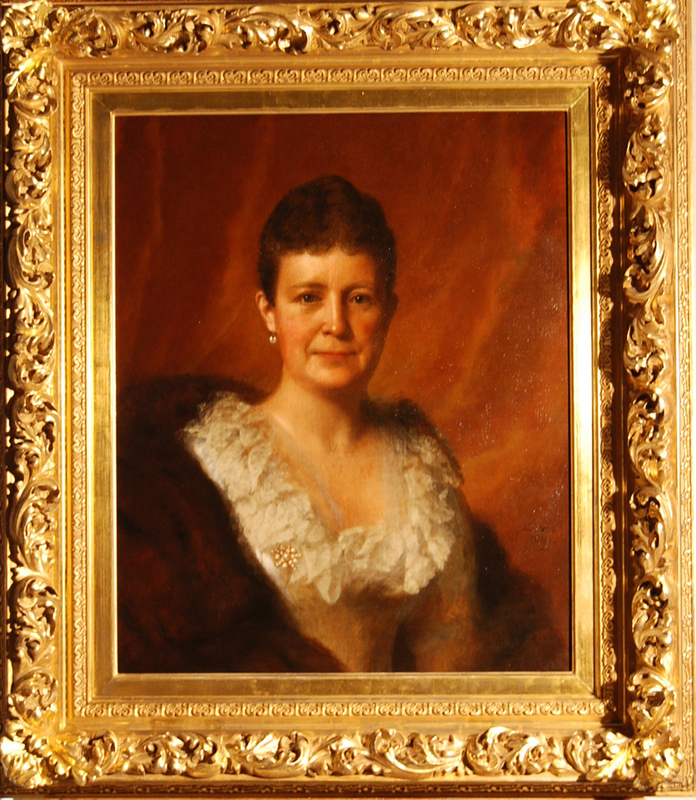 This portrait of Annette Henry Alger was most likely painted while they were in Detroit, Michigan and was framed behind plate glass to protect it while on public display. The painting is retained by the family. 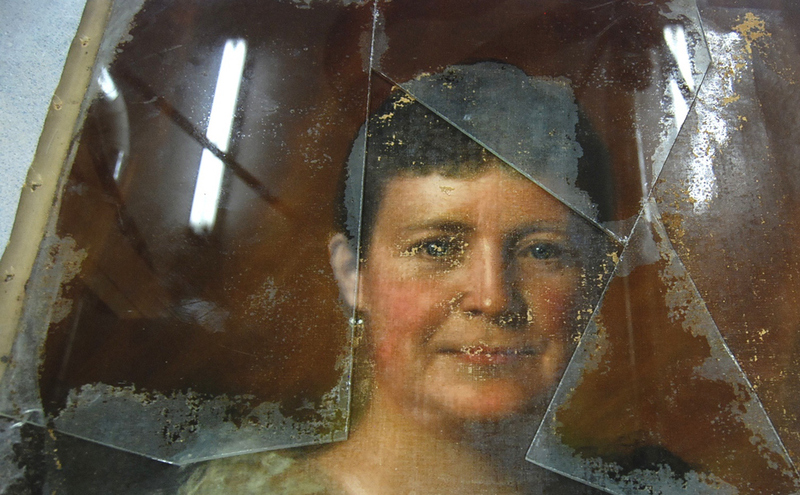 After the glass was removed, the painting was examined using ultraviolet light. Ultraviolet light allows a conservator to determine whether the painting has been previously restored showing all areas of repaint and allows them to determine the general composition of the varnish coating(s). In this particular case, the painting has a thick highly discolored layer of natural resin varnish and a heavy layer of dirt and mold. The dirt indicates that the painting did not originally have the glass on it for a long while and the mold, that the painting has been stored in a very damp location. 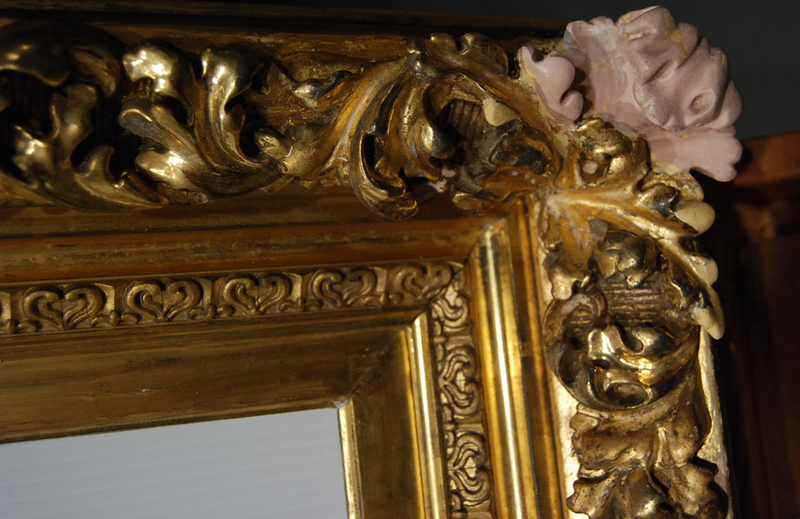 The frame is an exceptionally ornate example that appears to be original and from the period of the paintings creation. 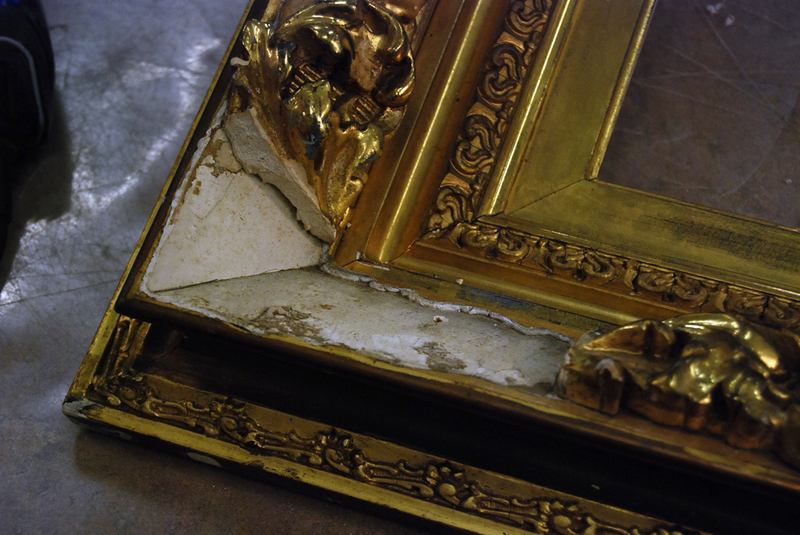 The surface of the frame is extremely dirty and overpainted with metallic paint. It has flaking and loose gesso and ornamentation throughout. There are large sections of gilded ornamentation missing in each corner. 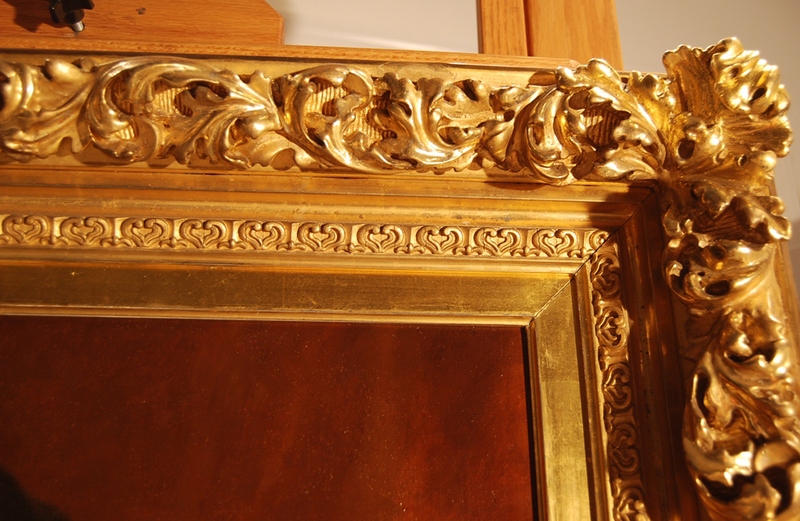 The frame is covered with gold leaf and some of it is highly burnished. There are surface scratches, abrasions, and gouges throughout. 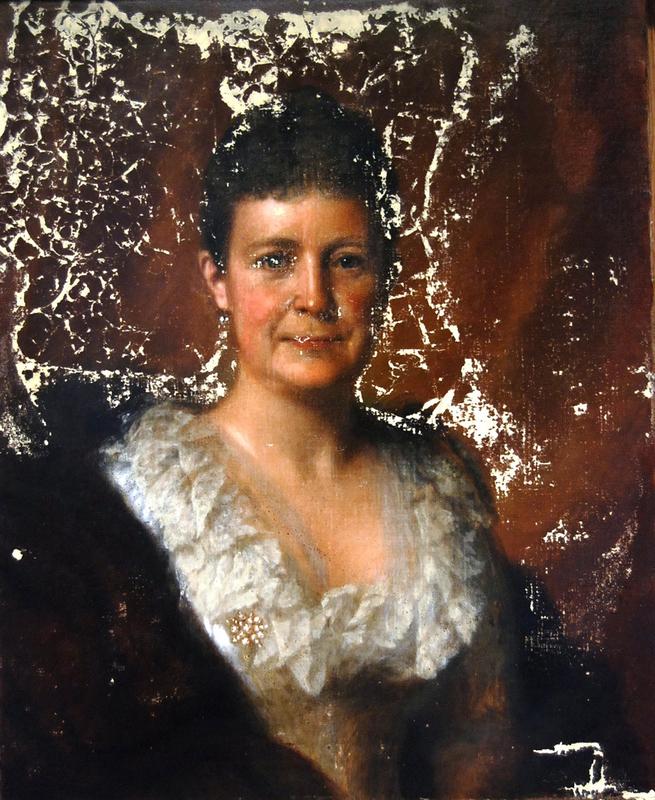 The painting was thoroughly examined at our conservation facility and a written report of its current condition, history and proposed treatment was prepared for the client to review. Once approved, the painting’s condition prior to treatment was documented using digital photography. Our profession’s Code of Ethics and Standards of Practice dictate that all treatments stages are photographically documented to both protect the conservator and create a history of treatment. Conservators, at a minimum, take before, during and after treatment photographs of an artifact. In order to proceed with treatment of the painting was removed from its’ frame and placed face down so that the tacks holding it to its stretcher could be removed. Once the stretcher was removed the canvas reverse was lightly cleaned and vacuumed. At this point a series of tests were conducted on the edges of the glass to formulate a method to safely remove the glass from the paint layer below. The following tests were tried and their viability was noted: organic solvents, mixtures, or gels; aqueous solvents or gels; heat from a tacking iron or heat gun; dry ice; using a spatula made of Teflon or steel; and mechanically with a scalpel blade. Only the spatulas were at all successful. It was possible to reach up under the glass and detach part of the right background and the entire face using a flat steel non-sharp pastry (icing) spatula. The remaining background was firmly attached to glass. We finally concluded that the only way to remove the glass was to score it and cut it up in pieces. Detached pieces came off easily and attached pieces didn’t. Where it was really stuck we scored the glass into small 1” to 2” shapes snapping it by hand with the painting still attached. After this each small piece was either shattered with the ball end of the wheel cutter, or twisted or popped off with a pair of needle nose pliers. There was minimal almost inevitable paint loss associated with doing this, but under the circumstances there wasn’t any other viable alternative. When we finally had removed all of the glass we noted that where the glass was firmly attached was now mirror-like and showed absolutely no canvas or paint texture. Following the removal of the glass, loose paint was consolidated with a wax/resin mixture using a small tacking iron. Discolored varnish layers, surface dirt and mold were then partially removed with appropriate organic and aqueous solvent mixtures. The painting’s structure was infused with wax resin adhesive and attached (lined) to a secondary canvas support (Belgium linen) on the vacuum hot table. The painting was then stretched onto its original stretched and keyed out until it was taught. 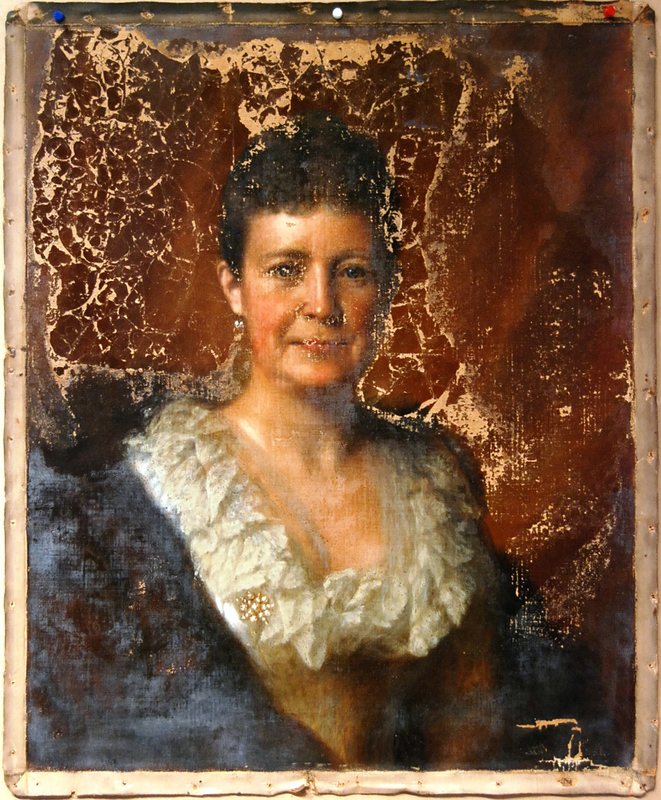 A spray coating of varnish was added to isolate additional conservation work from that of the original painting. Losses in paint and ground were filled with gesso and then carefully inpainted to match surrounding areas without overpainting the original artwork. Two brush coatings of a matt varnish were applied to build up the surface coating to minimize the difference in surface sheen caused by the plate glass flattening out all surface texture in the paint in some areas. Dirt and metallic overpaint were removed from the frame. Loose and flaking gesso ornamentation was consolidated where needed and missing ornamentation was cast from complete existing sections using silicon molding material. New pieces were made from carvable two-part epoxy resin and were attached with the same adhesive. Other losses were filled with gesso. New castings, fills and surface abrasions were inpainted with mica powders and acrylic paints. Areas of missing leaf were regilded using 24 carat gold leaf. The frame’s rabbit was slightly enlarged to accommodate the newly stretched painting. The painting was properly reframed with a backing board, brass mending plates and screws, “D” Ring hangers, and braided picture wire.